Wicked Hunting Lights™ is excited to announce the addition of the all new A48 Ambush Hunting Light with Intensity Control and Scan & Kill® Technology. Successfully target hogs, coyotes, fox, bobcat, raccoon and varmints at night with the Wicked Hunting Lights™ A48 Ambush Hog & Predator Hunting Night Hunting Light. The A48 is purpose designed & built specifically for night hunting. The A48 Ambush LED assembly is produced by an ISO9001 certified LED manufacturer for consistent color, reliability, and manufacturing quality. A48 Bezel Diameter: 48.0 mm / 1.89 inches. A48 Body Diameter @ scope mount: 25.0 mm / 1.0 inch. A48 Weight one battery installed: 11.3 ounces. A48 Length: 178.0 mm / 7.0 Inches. A48 Length bezel extended to MAX zoom: 188.00 mm / 7.40 Inches. The A48 features a full intensity control tail cap with the ability to power the light on at any desired intensity level. 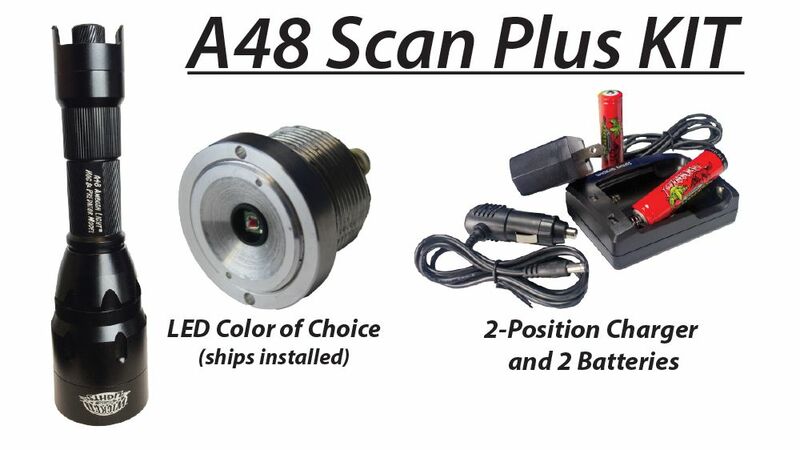 The A48 comes in your choice of Green, Red, or White Intensity Control LED. The LED assembly features a 3-year warranty, and can be changed in the field in less than 20 seconds for those wishing to use or experiment with a diffident led color. The A48 LED assembly is produced by an ISO9001 certified LED manufacturer for consistent color, reliability, and manufacturing quality. Weapon mounted light kits include picatinny style scope mount for use with 1 inch or 30mm tubes (also can be used to mount light on shotgun mag extension on many shotguns) and 2 light mounts (1 low mount for use with 40mm ojective scopes and 1 high mount for use with 50mm objective scopes).